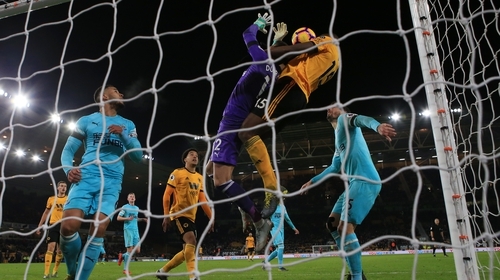 The defender nodded in deep into stoppage time - although the Magpies wanted a foul on goalkeeper Martin Dubravka with Boly appearing to have wrapped his arms around him - to earn a 1-1 draw at Molineux. Isaac Hayden's first goal for 17 months looked to have won it for Newcastle, who sit just a point above the Premier League relegation zone. Newcastle gave £20million record signing Miguel Almiron a second-half debut having worked their way into the game after Wolves' bright start. Rondon's weak header from DeAndre Yedlin's cross did at least rally Newcastle and allow them to finish the half on top. West Brom loanee Rondon even wasted a fine chance just before the break when Conor Coady deflected his drive wide from Ayoze Perez's cute ball. Ryan Bennett's flick almost fell perfectly for Matt Doherty at the far post but the defender - who scored a last-minute winner at Newcastle in December - put his header over under pressure from Sean Longstaff. Jimenez should have levelled with nine minutes left when Adama Traore's volley fell for him six yards out but he miscued his free header and the ball dropped well wide. Wolves had scored 13 goals in the final 10 minutes this season and made it 14 to level well into four minutes of stoppage time when Boly got above Dubravka to nod in Traore's looping cross from close range.